Prior research has been unable to explain the phenomenon known as post-earnings announcement drift, raising questions concerning the semi-strong form efficiency of the market typically assumed in capital market research. This study contributes to our understanding of this anomaly by examining drift in the context of theories that consider investors' non-Bayesian behaviors. The empirical evidence reveals that investors' overconfidence about their private information and the reliability of the earnings information are two important factors that explain drift. Finally, this study also provides insight into the puzzling relationship between dispersion and drift discussed in prior research. 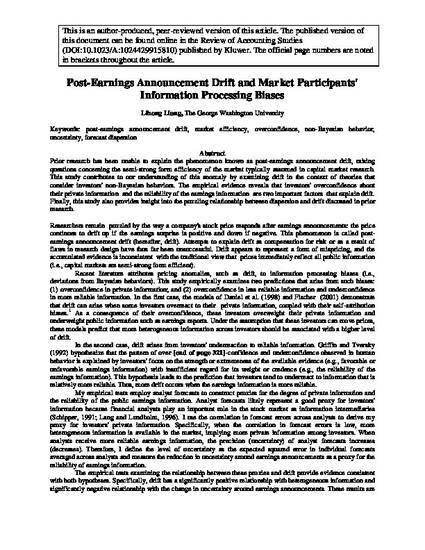 “Post-Earnings Announcement Drift and Market Participants’ Information Processing Biases”, Review of Accounting Studies, 8, 2003, p.321-345.